Not a Mustang nor a Ferrari, but a skimpy piece of wood mounted on a wheel and a rod of iron racing 50 mph down a Welsh mountain. 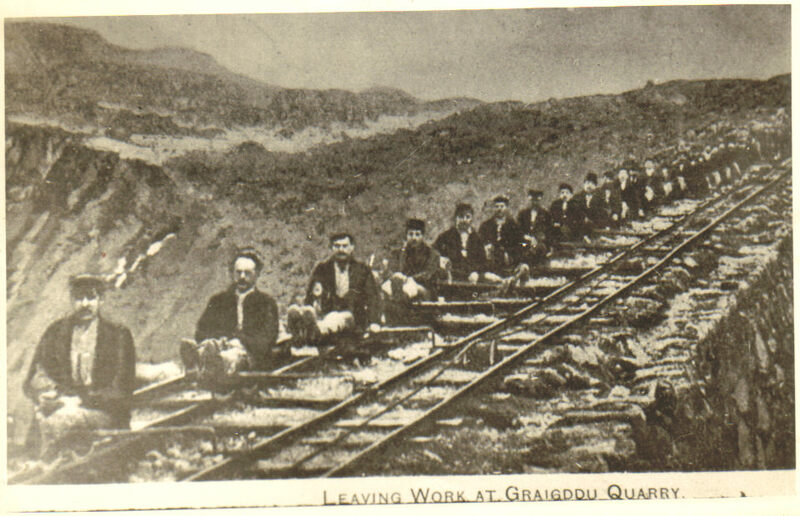 Getting slate down the mountain from the high quarries of Ffestiniog was a feat of Victorian engineering ingenuity. The power was provided by a wagon full of slate going down to pull up an empty wagon on a pair of narrow gauge rails running the length of an incline. Between each pair of rails was a steel rope, running on rollers, which connected the dependent wagons. The Craig Ddu quarry to the north of Manod Mawr had a set of three inclines to reach the road, and a fourth to link with the railway below running to Blaenau. This was the route to market. 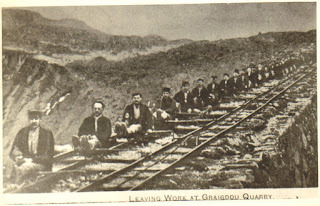 It was also the quickest way home for the workers after a hard day’s work. The length of the inclines to the road was 1,800 yards with a descent of 1,040 feet, and the journey, including the connecting sections, was reputedly done in about eight minutes. The Wild Car [or Car Gwyllt] was an innovation credited to the quarry’s blacksmith in the 1870s. It ran between the two pairs of rails which were separated by a gap of three feet, and, more importantly, without any obstructions such as the rollers between the narrow gauge tracks. The car consisted of very little. A piece of wood about two foot long and eight inches wide, with a “flanged” iron wheel towards the front and a V-shaped iron heel at the back. An iron bar stretched out from the centre of the board across to the other track to provide the balance on the other rail. Speed was controlled with a brake, which consisted of a handle between the driver’s knees that pressed a brake pad against the wheel – heels were also used! At its peak the quarry employed more than two hundred workers. Rush hour must have been quite a sight, and fortunately the occasion was captured in The Quarryman [or Y Chwarelwyr] which was filmed in 1934. Just looking at the inclines and the cars makes one think of danger and accidents, and there were many. Inexperience and recklessness were the main causes – unlike tobogganing out of control, there was no soft landing from a Car Gwyllt. A driver’s heel extended to slow his descent could kick slate onto the track and derail the car. Leaning too much or too little could cause the car to overbalance, and a stray foot could snag in the tracks. If you survived the impact you still had the risk of a substantial fall over the edge of the incline. Examples of reckless behaviour included riding two people to a car: the combined weight was too much for the brakes, and on one occasion the result was inevitable broken legs. A girlfriend riding on one’s knee was a thrill in more ways than one! Daisy would have looked fine upon the seat of a Car Gwyllt made for two. In an attempt to limit the accidents the afternoon rush hour was led by a “captain” whose job was to ensure a steady and smooth descent in an orderly fashion. “But on occasions we would wait until they had gone and see how fast we could go,” said Emrys with a twinkle in his eye. Children not yet teenagers would occasionally sneak into the works and take a car out in the evening. Sadly in the 1920s two of them were killed as they collided into a slate wagon. The cars were private property, and each carried the initials of its quarryman owner. Some of them had detachable brake handles which would be removed to prevent them being taken by anyone else. Second-hand Ceir Gwylltion (plural of Wild Cars) would exchange hands when a worker retired or moved on. A new one could be ordered and bought for ten shillings, and Emrys’s father built his son’s first one. The practice continued until the quarry closed in 1939, reopening for only a brief period towards the end of war to supply slate for repairing roofs bombed in the London blitz.